Pyrus subspecies. (Rosaceae). The European pear has developed mainly from the species Pyrus communis, indigenous to Europe and much of Northern Asia, particularly in the Caucasus and Turkestan. It is occasionally found in Britain though whether it is native is open to question. Certain other species of Pyrus are thought to have contributed to the evolution of the European pear but without doubt Pyrus communis is predominant. In Japan and the Far East, Pyrus pyrifolia (synonymous with Pyrus serotina) and Pyrus ussuriensis have been the main source for the development of Asian pears. Crosses between Pyrus communis and Pyrus pyrifolia have occurred both naturally (in the case of ‘Kieffer’, a cultivar raised as a chance seedling in the US and at one time widely grown there and in South Africa, especially for canning) and through controlled breeding, but Pyrus pyrifolia has played no part in the parentage of European cultivars. 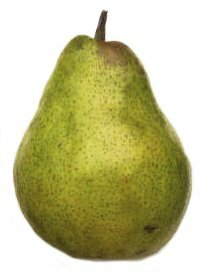 The pear is often mentioned in classical Greek and Roman texts. In Britain, there is little evidence for its introduction but it is assumed that some pears must have come into the country during the Roman occupation. However, records show that after the Norman Conquest rather more importation of the latest cultivars from the near Continent occurred, particularly from France. This was further strengthened in the 16th century by the strong influence of Henry VIII, by which time seedlings of English origin were being produced, including numerous variations of the ‘Warden’ pear, a cultivar specifically for cooking. The cultivation of pears in England and Wales was now widespread both in the garden and in orchards; they are among the most long-lived of fruit trees. Further introductions, particularly from Belgium and France, continued during the 18th and 19th centuries, one of the famous Belgian cultivars being ‘Glou Morceau’, raised in 1750 and still available today. In 1770, ‘Williams Bon Chrétien’ was raised at Aldermaston, Berkshire, a cultivar which is still grown worldwide (particularly for canning as ‘Bartlett’ pears; it was renamed ‘Bartlett’ when introduced to the US by a Lux Bartlett of Boston in 1799). European influence, especially Belgian, French and British, established the pear in those climates conducive to its successful cultivation – parts of North America and subsequently Australia and South Africa being specially favoured. ‘Packham’s Triumph’ was raised in Australia around 1896 and is still the most important cultivar there. It is also grown in South Africa and southern Europe. During the 19th century, Thomas Andrew Knight and the Royal Horticultural Society played a prominent role in further developments in Britain and many new cultivars became available, both home-bred and from Belgium and France. Of major note from France was ‘Doyenne du Comice’ (1849), which is widely grown and generally accepted as the finest flavoured of all pears. In England, the famous nurseries of Thomas Laxton and Thomas Rivers became major suppliers of pear trees, as of apples, for the large Victorian kitchen gardens of the great estates. ‘Conference’, the most widely grown and successful pear in Britain , was raised by Rivers in 1894. Their work continued through the first half of the 20th century, by which time controlled breeding programmes had developed at the John Innes and Long Ashton Research Stations. ‘Merton Pride’ from John Innes (1941) is still acknowledged as a particularly fine-flavoured fruit but is unreliable in cropping. From Long Ashton, ‘Bristol Cross’ (1921) was temporarily popular but ‘Conference’ remained more reliable. Some initial breeding of pears also continued in other parts of the world, notably in the US, and the one introduction from there of interest for garden culture in the UK was ‘Gorham’ for early to mid-season use. However, the incursion of the bacterial disease fireblight has severely restricted the successful cultivation of pears in the US, most of which is now concentrated in California and Oregon. Localised outbreaks of fireblight have also caused occasional problems in the UK since about 1960. 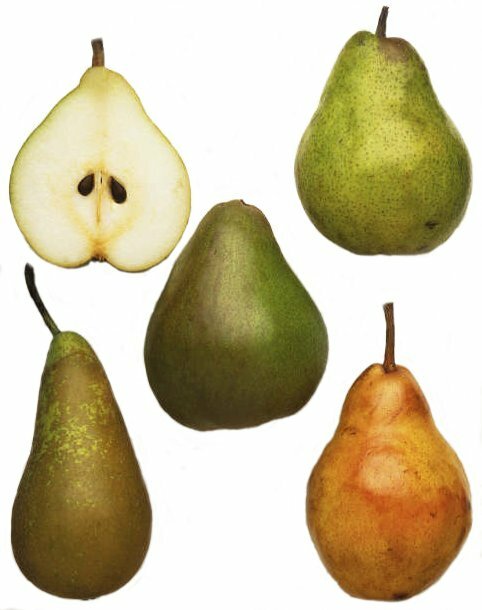 The shape of pears varies greatly with cultivar, markedly more so than with apples. The classification usually adopted (form Bunyard’s Handbook of Fruits – Apples and Pears, 1920) includes six groups as follows (1) Flat and round (e.g. ‘Passe Crassanne’; (2) Bergamotte (flat, rounded/conical; e.g. ‘Winter Nelis’); (3) Conical (e.g. ‘Beurre Hardy); (4) Pyriform, or wasted (e.g. ‘Doyenne du Comice’); (5) Oval (e.g. ‘Emile d’Heyst’); (6) Calabash, longer than pyriform (e.g. ‘Conference’). Pears flower comparatively early and freedom from frost and some good summer warmth is essential for consistent cropping. In Britain the possible ravages of bullfinch damage to the over wintering buds should be noted. Netting the trees is the only certain protection: without it severe damage can render a tree worthless, although this is localised and varies in intensity. Adequate shelter is essential to ensure warm conditions for cross-pollination and also to protect fruit and foliage from cold winds, which in severe cases can quickly blacken leaves and fruitlets. In many cases good results with late-maturing cultivars (e.g. ‘Joséphine de Malines’ and ‘Glou Morceau’) require the warmth of a south-facing or west-facing wall in cool temperate regions for the production of quality, well-flavoured fruit. The incidence of scab is also reduced. Choice of cultivar away from favoured southern counties of the UK becomes more restricted to early-ripening kinds. Similarly, in the northern states of the US there is a restriction in the range of cultivars that will withstand the harsher conditions, among the best being ‘Calebasse Bosc’. 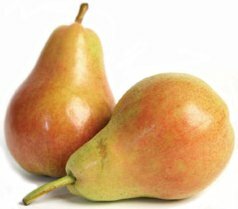 By contrast, it is the cooler areas of Australia and South Africa that grow pears most successfully, the Asian pear being better suited to hotter districts. Of all countries historically associated with the development of the pear, however, it is France and Belgium that are in the forefront and, both in those countries and in parts of southern Europe such as Italy, the climate allows the successful growing of a wide range fo cultivars covering a long period of ripening from mid-summer to late winter. Fireblight however remains a serious problem. The pear usually succeeds on most soil types although, as with apple, the highly calcareous areas may well induce deficiencies of iron and manganese through lime-induced chlorosis. Furthermore, the pear is more tolerant than apple of wet (not waterlogged) conditions but less so of drought, so that mulching and irrigation may be necessary where conditions dictate. This is paticularly important for newly planted trees if they are to establish quickly and satisfcatorily, and where mulching is undertaken regularly this will also eventually help to offset the deficiencies caused in calcareous soils. A well-drained, good medium loam is undoubdtedly the best soil for pears, since it not only offers balanced food reserves but also moisture retention. The heavier soils will normally produce better-flavoured fruit than the hungry sands and gravels. The availability of a suitable rootstock for pears has never been satisfied. Grown on pear seedling stock, trees can attain great stature and longevity but with attendant delay in cropping, and records show that over many centuries certain other species have been tried in an endeavour to reduce tree size and to quicken cropping. In the 16th and 17th centuries the hawthorn was recommended but with variable and inconclusive results. Some French Writers at this time recommended the quince as the best alternative, many pear cultivars thriving on it with marked precocity of fruiting. Quince was slowly taken up by British growers, but with the same variablility in material used as had occurred with the many selections of apple rootstocks. Early in the 20th century, Hatton at East Malling Research Station established two reliable selections of quince, A and C, that are still the standard rootstocks for pears in Europe today. ‘Quince A’ (‘Angers Quince’) is moderately vigorous and has been the most widely used; ‘Quince C’ is somewhat more dwarfing but only in recent years have virus-free strains become generally available. It is particularly useful for inducing early fruitfulness in naturally vigorous cultivars such as ‘Doyenne du Comice’. A major disadavantage of quince rootstock is that it is not compatible with all cultivars of pear, among them ‘Williams Bon Chrétien’, ‘Jargonelle’, ‘Marie Louise’ and ‘Packhams Triumph’. Commercial orchards in other pear-growing areas of the world still tend to use rootstocks that produce larger trees. Quince rootstock is sufficiently vigorous to counter the hotter drier conditions often met with in the fruit-growing areas of Australia, South Africa and the US, although it is used to produce small trees for gardens. Seedling pear is still used in some cases and, in Australia, seedlings of the Asiatic species Pyrus calleryana are used, a selection known as D6 being considered best. Its use prevents the fruit disorder known as blackend developing in the scion cultivar. The choice of cultivars for the garden in the UK is limited unless a suitable warm wall with a southerly or westerly aspect is available. ‘Conference’ is the most widely successful, ‘Williams Bon Chrétien’ and ‘Doyenne du Comice’ are also popular. Valuable new introductions from East Malling research Station include ‘Beth’ (early September), ‘Onward’ (September-October) and, most recently, ‘Concorde’ (October). The late-ripening cultivars, even ‘Doyenne du Comice’, will require the warmth of a wall for the production of quality fruit where conditions are cooler. On south-facing or west-facing walls, ‘Beurre d’Anjou’, ‘Beurre Hardy’, ‘Buerre Superfin’, ‘Doyenne du Comice’, ‘Emile d’Heyst’ and ‘Joséphine de Malines’ can be grown; on south-facing walls, ‘Le Lectier’ and ‘Passe Crassanne’. Purely culinary cultivars are now seldom grown but ‘Catillac’ is occasionally listed. Until fire blight was reported in the UK around 1960, the early pear ‘Laxton’s Superb’ was highly popular, particularly for garden culture. Ripening in August, it possessed fair eating quality and was reliable, but it proved to be particularly susceptible to fire blight, and was officially condemned and trees grubbed and burnt in an attempt to arrest the spread of this serious disease. Subsequent outbreaks when weather conditions favoured the disease have proved that it is now endemic and it has spread to a range of other rosaceous genera in gardens (e.g. Cotoneaster, Pyracantha and Sorbus) as well as to hawthorn in the wild. Elsewhere, ‘Williams Bon Chrétien’ (‘Bartlett’) is most probably the most widely distributed, being grown (largely for canning) in the US, Australia and South Africa as well as Europe. ‘Packham’s Triumph’ is similarly popular, while ‘Passe Crassanne’, ‘Glou Morceau’ and ‘Dr Jules Guyot’ (among others) are also in commercial production. 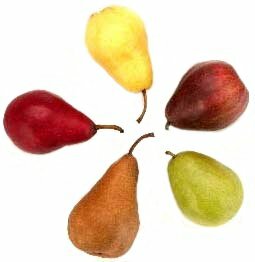 In North America all the pears of French origin are available as many of local raising like ‘Harrow Delight’ (Canadian), ‘Luscious’, ‘Magness’ and ‘Moonglow’; ‘Red Bartlett’ and ‘Sensation’ are red-skinned. A US group called Southern-Cross Pears, or just ‘hybrid pears’ (sometimes named Prunus X lecontei) are crisp-fleshed and very long-keeping. They include ‘Ayres’, ‘Kieffer’, ‘Orient’ and ‘Pineapple’, and are usually grown for canning. Most cultivars of European pear are not self-fertile and provision of suitable pollinator cultivars is imperative. ‘Conference’ is not self-fertile as often erroneously stated, although it sometimes does produce parthenocarpic (seedless) fruits under adverse conditions. Most cultivars are diploid, a few triploid or tetraploid. The high-quality ‘Merton Pride’ is also triploid. ‘Bristol Cross’, ‘Beurre Bedford’ and ‘Marguerite Marillat’ are male-sterile and therefore ineffective as pollinators. There are also two groups whose cultivars are incompatible, and detailed advice on pollination is therefore essential, introduced ‘Onward’ and ‘Doyenne du Comice’ are cross-compatible. The time of flowering varies considerably and it is important to choose combinations within which flowering coincides as closely as possible. If a triploid is planted, the same pollinator provision is necessary as for apple. Planting is best done in late autumn and early winter while the soil is still comparatively warm but can be delayed up to late winter if necessary. Later plantings may be slower in establishing and judicious mulching and watering may be necessary. Suitable staking is advisable in all cases for the first two years or so; trees on ‘Quince C’ rootstock may need staking permanently. Planting distances for the different tree forms closely follow those quoted for apple, the greater ones being selected for trees on ‘Quince A’ and the more vigorous cultivars, the lesser one for ‘Quince C’. Any trees on seedling pear will require at least 6m spacing. Soil management is predominantly the same as for apple but, since pears require rather more moisture, careful control of any grass sward is essential, particularly regular mowing and allowing the cut grass to lie. This is especially necessary for trees in lawns on quince stock. Irrigation must be given when called for. Tree forms for garden trees closely follow those for apple, namely cordon and its variations, espalier, fan and dwarf pyramid. Commercial trees are more usually trained as goblet or vase shape, although in some cases (e.g. Australia) large centre-leader trees are grown. Trellis systems such as palmette are popular in southern Europe, also in Australia. The training of pear trees closely follows that of apples. The cultivars vary considerably in their natural vigour; thus ‘Conference’ makes only moderate growth, whereas ‘Doyenne du Comice’ and ‘Merton Pride’ are more vigorous. 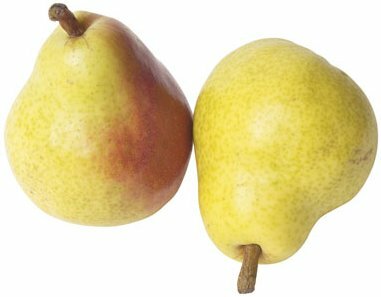 In most cases, pears produce spur systems very readily and only a few tip bearers exist, ‘Jargonelle’ and ‘Joséphine de Malines’ being among them. Like apples, such cultivars are more difficult to manage in trained forms such as cordon or espalier. Where goblet-shaped and vase-shaped trees are being trained, it is important that the initial branch angles with the main stem are wide; if too narrow, branches will break away from the trunk once heavy crops develop. Established cropping pear trees frequently develop more intricate spur systems than do apples. The general build-up of trees is similar to apple and pruning is done at any time from leaf-fall to late winter. The degree of pruning will depend on the fruit bud to growth ratio – less pruning for vigorous trees than for those of more moderate or weak habit. Some laterals can be shortened to three or four buds to encourage spur formation, a few of the most vigorous removed completely if overcrowded. The spur systems on older trees will require shortening and even complete removal where overcrowded, otherwise too many small fruits may result. Branch shortening (dehorning) may be necessary when individual branches become too long, but in general tip-pruning should not be necessary. Where branches become too crowded, some branch thinning is essential but only a small proportion should be removed in any one season. Pears require rather more nitrogen than do apples but only where growth is unsatisfactory. Potash is also important and rates to apply are generally as for apples. Under conditions of too high pH, iron and manganese deficiencies are common. Surface applications of rooted farmyard manure every two to three years will help, but in severe cases the deficiencies should be rectified by appropriate means. Trees that are neglected or starved will need extra applications of nitrogen, one early in spring and one in late spring. Where heavy crops develop, some fruit thinning will be essential to enhance fruit size. Thin to one fruit per cluster, two if leafing is good and there is sufficient space. This should be done after the natural shedding of fruitlets about mid-summer. Heavily laden branches will need support to prevent breakage. The harvesting of pears requires careful monitoring, particularly for earlier cultivars, such as ‘Williams Bob Chrétien. The fruit may be picked while still green yet parting readily from the spur. If left too long the flesh will rapidly over-ripen and become ‘woolly’. Later cultivars, on the other hand, must be allowed to mature fully; too-early picking will result in fruit shrivelling and loss of flavour especially under domestic storage conditions. Domestically, pears are best stored either in polythene bags (as for apples) or in cool, dark, slightly moist conditions as found in cellars or outhouses. They should be conditioned in normal room temperature (18ºC) for 2-3 days before consumption to ensure full flavour and good eating texture. Commercially, special cold storage conditions are called for with temperatures near freezing point. Propagation of pears is normally by budding or grafting. The problem of incompatibility on quince involves special techniques, otherwise what at first appears to be a successful union between scion and the quince rootstock proves to be imperfect and weak and sooner or later the tree is likely to snap off at the union. The problem is overcome by double-working, which involves introducing a short piece of graftwood from a compatible cultivar which is grafted directly onto the quince, the incompatible cultivar then itself being grafted on top. An alternative is the placing of a small shield of the compatible variety in the budding operation, again to act as a bridge between the quince and the bud of the incompatible cultivar. The cultivar most commonly used as an intermediate stock in such situations is ‘Beurre Hardy’; others include ‘Doyenne du Comice’, ‘Pitmaston Duchess’, ‘Vicar of Winkfield’ and ‘Glou Morceau’. The Asian pear, also known under a number of common names including Oriental, Chinese, Japanese and Nashi (the Japanese for pear), is derived from Prunus pyrifolioa and Prunus ussuriensis. Japanese cultivars are selections of the former, while the Chinese are from hybrids between the two. Prunus pyrifolia is indigenous to Central and West China, where the fruits are eaten; Prunus ussuriensis is native to Northeast China and Eastern Siberia and is particularly hardy but with small unpalatable fruits. Until recently the Asian pears were generally restricted to the regions of or near to their origin – China and Japan – where they have been known and used since ancient times and where extensive commercial production progresses. Current cultivation is expanding world-wide, predominately in Australian temperate zones, California and parts of Central America. 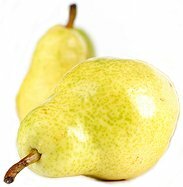 The chilling requirement is less than that for European pears and so the potential for the Asian pear’s extended cultivation is considerable. In Britain the climate is not usually conducive to success, the fruit in poor seasons remaining small (golf-ball size or slightly larger) and bland in taste. Even in more favoured regions the flavour is less rich and the texture crisper and less melting than that of European cultivars; the fruit is also widely used in salads. Cultivation is generally similar to that of European pears. Rootstocks include Asian pear seedlings, Prunus betulifolia and Prunus calleryana; in Japan, Prunus pyrifolia seedlings are favoured. Growth can be vigorous but trees tend to commence fruiting quite early. Fruit is borne on two-year and older wood, with some on one-year laterals. Flowering occurs at the same time as with European pears (which are suitable as pollinators). Asian pears are partially self-fertile but a mixture of cultivars is advisable to assist adequate fertility. Heavy fruit set will require judicous thinning to encourage fruit size, reducing fruits to one per cluster one month after flowering and with an additional thinning around mid-summer on naturally small-fruited cultivars. Horizontal trellis systems as practised in Japan give excellent results but labour input is heavy. The ripening fruit predominately turns from green to russet-brown but some Chinese cultivars turn paler green-yellow. Fruits are very delicate and mark easily. They will keep for about two weeks in normal room temperature but later-maturing cultivars, mostly of Japanese origin, include ‘A-Ri-Rang’, ‘Chojura’, ‘Hosui’, ‘Kikusui’, ‘Kosui’ (highest-rated Japanese commercial cultivar), ‘Niitaka’, ‘Nijiseiki’ (‘Twentieth Century’), ‘Seigyoku’, ‘Shinko’ and ‘Shinseiki’; ‘Tsu Li’ and ‘Ya Li’ are of Chinese origin. Ripening of the earliest commences in late mid-summer continuing through to early autumn for the latest. The trees can also be decorative, with attractive white blossom, glossy green foliage and striking red autumn coloring. Pears can be affected by armillaria root rot (Armillaria subspecies), bacterial (blossom) blight (Pseudomonas syringae), bitter rot (Glomerella cingulata), blue mould and other storage rots (Penicillium subspecies and other fungi), brown rot and blossom wilt (Sclerotina subspecies), canker (Nectria galligena), coral spot (Nectria cinnabarrina), crown gall (Agrobacterium tumefaciens), fireblight (Erwinia amylovora), leaf curl (blister) (Taphrina bullata), powdery mildew (Podosphaera leucotricha), scab (Venturia pirina), silver leaf (Chrondrostereum purpureum), sooty blotch (Gloeodes pomigena) and white root rot (Rosellinia necatrix). Pears can be the aecial host of several heteroecious rust fungi (Gymnosporangium subspecies) and one of these Gymnosporangium fuscum, although rare in Britain, is common in Europe. Leaf fleck caused by Mycosphaerella pyri causes numerous small spots on the leaves and fruits but would be controlled by the routine fungicide sprays used for scab control. Pears can also be affected by several viruses and by the pear decline mycoplasma but these are unlikely to be of importance to the gardener, especially if certified virus-free plants can be obtained. The more important pests include a gall midge, pear midge (Contarinia pyrivora); a gall mite, the pear leaf blister mite (Eriophyes pyri); the pear and cherry slugworm (Caliroa cerasi), often called pear sawfly in the US; pear psyllid or sucker (Psylla pyricola); pear thrips (Taeniothrips inconsequens) and the mussel scale (Lepidosaphes ulmi) referred to as the oystershell scale in the US. Several species of aphids attack pear; the most damaging in Europe is the pear-bedstraw aphid (Dysaphis pyri).